Our gentle natural cleanser is made with soothing active 16+ Manuka honey and plant oils to remove your makeup naturally. Witch hazel will tone your skin and the glycolic acid (sugar beet extract) removes dead skin cells. The result is a smoother cleaner skin. 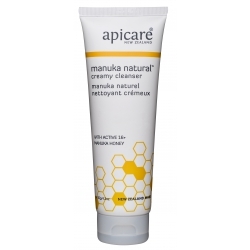 Manuka Natural Creamy Cleanser allows you to cleanse and tone in one simple step and removes excess oil & makeup without drying or irritating your skin. Fragranced with pure essential oils and suitable for all skin types. Cleanse and tone in one simple step. Our Creamy Cleanser is a gentle velvety cleanser that removes excess oil, make up and daily debris. Formulated to cleanse without drying or irritating, the combination of Sweet Almond oil, Avocado oil, Sesame oil and Shea Butter nourish, while the active 16+ Manuka honey maintains hydration. Witch hazel has been included for its natural dual cleansing and toning ability. This creamy cleanser can be either tissued or rinsed off to remove all residual creme and debris. Subtly fragranced with essential oils and suitable for all skin types. Gentle enough to use every day. The bark, leaves, and twigs of witch hazel are all high in tannins, giving this plant its astringent properties. Used on skin witch hazels astringent properties reduces inflammation, tightens pores and removes excess oil. Witch hazel also contains procyanadins, resin, and flavonoids, all of which contribute to its anti-inflammatory and soothing properties. 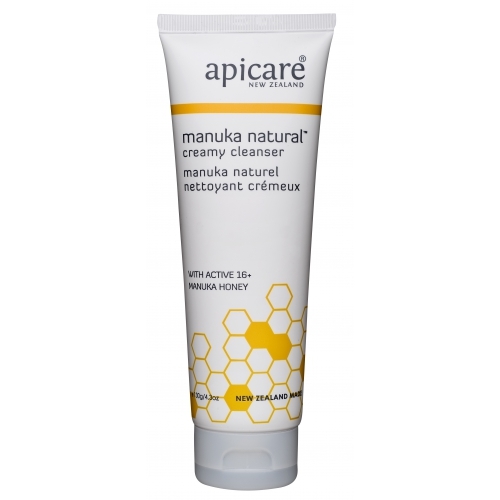 Manuka Honey is tested for its level of non-peroxide antibacterial activity and issued with a number. So a rating of 10 indicates the same level of antiseptic potency of a 10% solution of Phenol (Carbolic Disinfectant). The higher the rating, the higher the activity level is, and therefore the greater the healing ability.